"The only thing I know, is that one minute I am a prince, charming and handsome, cutting-a-rug, and the next thing I know...[trips over his feet]"
Back in May when I first introduced the trailer and poster for The Princess and the Frog, never did I think it would go on to hit the number spot at the box office in its opening weekend and garner a Golden Globe nomination. But I knew when I first heard about Disney rolling out the red carpet with a long overdue African-American lead, it was something special. It's funny because when I walked into the movie theater today I thought I was going to be the only adult watching this animated movie. But I was certainly not alone. Yes, there were kids there but surprisingly there were many adults there who did not bring kids. And we were all in for quite a treat. 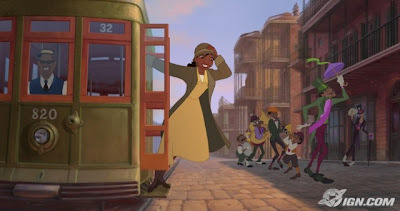 Much like my favorite Disney film The Little Mermaid, The Princess and the Frog follows a young girl with a big dream. For Tiana, a determined young waitress from New Orleans, she dreamed of fulfilling the wish her father never saw come true--opening up her own restaurant featuring her savory Big Easy dishes like etoufee, gumbo and beignets. All she needed was a few extra dollars saved from working two jobs to be able to pay the down payment on the spot she'd be eyeing. Overworked and missing out on all the other things other girls her age were doing, Tiana's dream got slightly deferred when a prince leaped into her life one day and turned it all around. Only thing is, he's been turned into a frog by an evil voodoo slinger after his own arrogance got the best of him. The prince must be kissed by a princess in order to revert the curse. In the end, Tiana learns another lesson--when you have love in your life, all your dreams come true. Filled with heartfelt songs led by Toni Award winner Anika Noni Rose (Tiana), humor, and a brilliant capturing of the vibrance of the Big Easy The Princess and the Frog will certainly be remembered years later as not only a pioneer Disney movie, but also one that allowed audiences to never let go of their dreams and that with love anything is possible, no matter your age or color. That's something everyone can take pride in. Check out an exclusive clip from the movie below. The Princess and the Frog is in theaters now. I Absolutely loved it!! A black princess...uh yeah, it's about time :) "Almost there" --I love that song. Tiana kept believing in her dream no matter what, I LOVED that message!!! So much going on with the "Shadow Man" over at "Transformation Central" I love the setting of New Orleans for the story because it makes all the mysterious happenings and the colorful characters such as, Mama Oddie almost believable. lol I love how the Fireflies were powerful enough to chase away the shadowy creatures, despite their small size. :) I love the part about Evangaline ...:) Awesome movie...long overdue and GREAT GREAT GREAT!! !